When I took my first screenwriting workshop class in college that focused on television, the final product everyone worked towards was writing a spec script for a current comedy. A few people picked 30 Rock, which was in the middle of a 3-year Emmy run, a few on the frattier side picked Always Sunny, and there was even a Reno 911 in there even though that show was largely improvised (not that you asked, but I wrote a How I Met Your Mother spec involving a surprise birthday party…and turned it in the week before that year’s season finale, which featured, you guessed it, a surprise birthday party). One girl stuck to her guns against the advice to choose a more viable portfolio spec and picked Psych, which had just finished its third season with “An Evening With Mr. Yang” – still my favorite episode of the series. She wasn’t going to send it out in LA as an example of her work, she just really liked the show and wanted to live within that universe for a quarter and write those voices. “Neil Simon’s Lovers’ Retreat” isn’t the funniest episode of the sixth season, but for my money it’s the best so far. It has plenty of laughs, a few memorable guest stars in Jason Priestley and Tony Hale, throws the characters together in a way that creates the witty banter Psych does so well, and threw in some emotional revelations to boot. Perhaps it helped that there wasn’t exactly a guiding theme to the episode. Sure, it has Neil Simon in the title, but that seems to be a looser stylistic reference point than some of the other very specific genre homages that Psych has used over the years. Shawn and Juliet finally get to be on their own as a couple, away from work – even though it’s clear that work won’t leave them alone for the duration of the trip. Shawn has to say goodbye to Gus for a few days, but splitting the main two characters up didn’t hurt this episode as much as it did a couple weeks ago at the hippie commune. 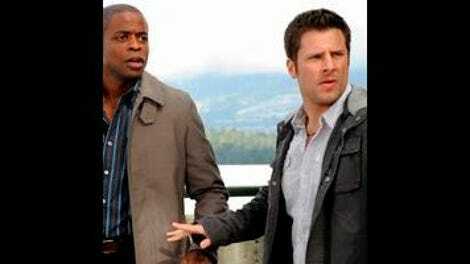 Psych typically delays dealing with bigger emotional moments until episodes like a midseason finale. Over the first half of the season, Shawn’s antics have skewed even goofier, making me wonder what in the world Juliet even sees in him anymore. With all the sexual tension drained out of the situation, there wasn’t any playful flirting, just a lot of Juliet harping and acting like a mother to an incredibly childish boyfriend. Only a few moments stood out from that homogeny of disappointment, the end of the William Shatner episode where Shawn organizes a birthday party, and the end of the season premiere, when Lassiter grills Shawn and warns him not to hurt Juliet. For the first half of the episode, he was still like that, whether he was staring into Gus’ eyes before leaving or rejecting Juliet’s ideas for things to do around the spa in Ojai. After the con couple showed up and robbed their room though, things started to shift. While working on the case together, and in one instance pointedly telling others that they wanted to investigate alone as a couple’s thing, I liked that they blended relaxation into their routine, like the climactic car chase aided by a romantic hot air-balloon bird’s-eye-view as a guide. This episode didn’t have the most laughs of the season for me, but it did accomplish all of the things I think make for the best episodes of Psych that aren’t the Yin-Yang Killer finales. Gus, Lassiter, and Henry have the weekend alone, so of course they all end up in the same grocery store, buying scented candles, a shopping cart full of light bulbs, and two-for-one Hawaiian shirts, respectively. They aren’t integral to the first half of the plot at the spa, so the episode has them riffing in the store, then going out to bar where they compete to see who can get a woman’s phone number first. Gus empties the floor with his dancing, Lassiter fails at a ridiculously lame cell phone trick, but Henry pulls out a number and wins the bet. Unfortunately, the girl is a Stage Five Clinger, giving the three guys an easy out to meet up with Juliet and Shawn in Ojai, and sets up the obvious callback joke when she shows up at the hotel after Henry texts her. Though it did feel contrived, I’m willing to overlook that point in favor of all the quips that these guys throw around at each other. When they get bogged down in police work or split up into groups, the dialogue tends to suffer. The final moment when Gus discovers the hidden engagement ring was nice for several reasons. First, it justified Shawn’s obsession with the Nintendo DS, which initially just seemed juvenile, but turned out to be genuine fear that something far more valuable had been lost. Second, it added another layer to Gus and Shawn’s partnership. Those two have always struck me as a more outlandish version of J.D. and Turk from Scrubs, and their best plots on that show dealt with the shifting aspects of their friendship as they grew older. Shawn and Gus aren’t moving in that direction in the same way, but my favorite aspect of these last few episodes between the two of them was Gus admitting that Shawn’s “stable” relationship has made him cast a wider net looking for a girl. Juliet has no idea that Shawn was going to propose, and admitted that she’s not even thinking that far ahead. That made a whole lot of sense to me, since Shawn still has a lot to prove to outweigh how cripplingly immature he can be. His apology tries to justify his behavior, but it sounded more like ignoring how he’s been this season. What I still find frustrating is that the emotional fallout - Shawn buying a ring, Juliet revealing she’s not ready for marriage, and Gus discovering Shawn’s plans – most likely won’t come until the season finale. Psych trades in delayed gratification when it comes to the longer arcs in the show, but giving out those answers a little more often in this kind of mold has always been the better idea. In a sixth season, that’s never going to happen, and I’m fine coasting along in the slightly above-average range most of the time, but after episodes like this, I wish there was a little more drive to do better. Tony Hale continues the streak of the highest-profile guest star turning out to be the culprit. I was thrown by how little he actually appears in the episode, but I bet a lot of people guessed from the opening scene that it would be him. For the first time since the season premiere I didn’t really talk about the case, but maybe that’s because it sort of took a back seat and wasn’t part of a Santa Barbara investigation. There’s the con couple, but then a murder at a winery and some business dealings. I wasn’t wrapped up in that part very much. Psych will be back in February with guest appearances from Wayne Brady, French Stewart, and maybe another William Shatner drop-in. Thanks for following along this fall, and come back in a few months!